Even if you're unfamiliar with the particulars of the story, it will probably not come as a surprise to learn that the next day, Church returns, albeit somewhat worse for wear—he smells awful, he is ill-tempered and begins lurking about as if he was a prop in a horror movie. Yes, it turns out that this burial ground has the power to bring the dead back, though, as a now-regretful Jud points out, they are not the same as they once were. It will probably come as even less of a surprise to learn that, following an even greater tragedy, a grieving Louis will choose to take advantage of the burial ground once again in the belief that things will surely work out better this time around. Needless to say, it all goes bad as Louis’ well-meaning attempt to cheat death quickly devolves into a Grand Guignol-style procession of flashing knives, spurting blood, and sliced hamstrings. Although “Pet Sematary” is a largely dreadful film, it is slightly better and never as offensively bad as the first version. And a couple of the performances are pretty good—Seimetz and Laurence are both reasonably touching and believable in their roles and Lithgow’s amiable old coot game is strong as well. That said, this is still one of those stories whose ghastly power works best on the page, because it forces the mind to conjure the kind of imagery that most people go to extraordinary lengths to avoid having to contemplate in real life. Brought to life, both then and now, those unimaginable horrors can’t help but come across as greatly reduced and rather silly by comparison. As a result, an unforgettable work of horror literature has once again been reduced to an eminently forgettable movie that may do well at the box office for a week or two before disappearing from view and evaporating from the mind. 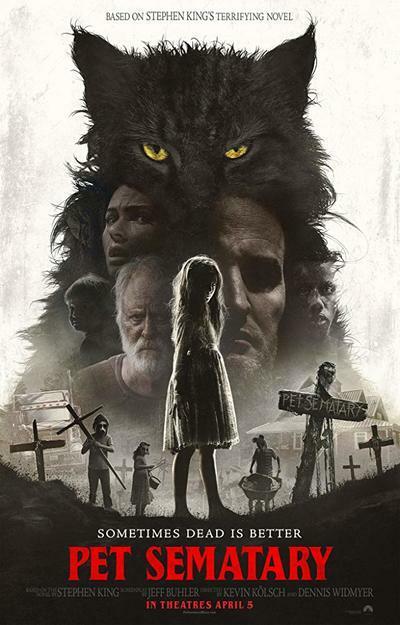 The only genuinely scary thing about this "Pet Sematary" is the possibility that a couple decades from now, some may convince themselves that it too is a classic.